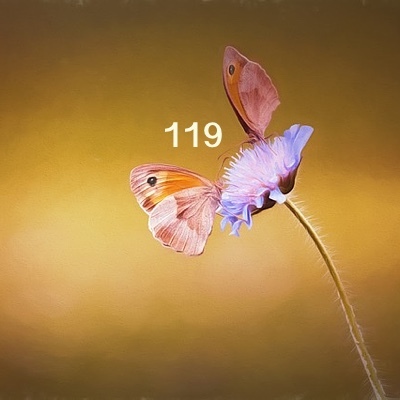 The numerology energy represented by the number 119 resonates with the idea of co-existence and includes both relationships and self-reliance. The energy is of independent coexistence, like butterflies sharing the nectar of a flower. There is also compassion, tolerance, and humanitarianism. And exploration, self-determination, and periods of aloneness. But mostly, the resonance of the energy represented by 119 is of coexistence and aspects of coexistence (like teamwork and diplomacy). It is a kind energy that resonates with compromise and cooperation. It invites discussion and is always available to help mend disputes or rifts among members of the team. The number 119 reduces to the single-digit number 2. The energy represented by the number 2 resonates with — among other things — teamwork, relationships, and diplomacy. It contributes the majority of the resonance represented by the number 119. The energy represented by the unique digits that compose the number 119 also contribute to the whole. Thus, the number 1 energy adds self-determination, independence, and exploring new ways of doing things. And the number 9 energy adds humanitarianism, tolerance, and philanthropy. Additional characteristics the energy 119 represents are described further below. The list contains key words that each represent an aspect of the essence of the 119 energy vibration. Additional key terms would be teamwork, self-determination, exploration, aloneness, self-sufficiency, humanitarianism, compassion, philanthropy, idealism, and tolerance. Meanings of the number 119 are interpretations of the energy the number represents in relation to what it applies to, or the situation or circumstances where the number occurs. A person whose personality number is calculated with an intrinsic number 119 tends to present themself as a valuable teamworker who can think for themself as required. There is an intrinsic inclination to solve social and family-member issues diplomatically. And feel most comfortable in a relationship — home, friend, romantic, social, or career. A person whose destiny number is calculated with an intrinsic number 119 tends to resonate with, above all, the idea of existing with others in a mutually-beneficial way. They also tend to be compassionate and self-reliant. With the number 119 pertaining to something in the environment, interpret the situation as if it included teamwork, compassion, exploration, independence, or a relationship of some kind. 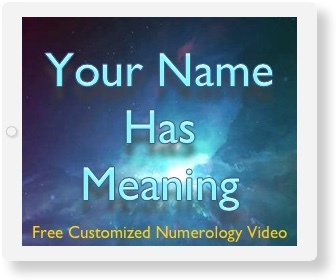 See the article Numerology Number Meanings for an introduction to the essence of the energies that numbers represent, and for deriving meanings for individual numbers depending on what the number pertains to or is associated with. The deep down basic essence of the energy the numerology number 119 represents is coexistence. Other meanings of the number 119 must take that resonance into account. The digit the number is reduced to (the digit 2 in this case) always has more force or capacity than the digits of the number being reduced, even when the number being reduced has repetitive digits. The energy represented by the numerology number 119 resonates with teamwork, relationships, and diplomacy. Teamwork, pulling together, companionship, romance, diplomacy, cooperation — all are in the number 119’s realm. 119 energy is self-determined and self-sufficient. It feels an urge to explore new ideas, and new physical locations. Although expressing independence, the deep down basic resonance of the energy the numerology number 119 represents is coexistence. It tends to be compassionate, tolerant of religions and life styles, and philanthropic for the welfare of humanity. The energy has an inherent proclivity for dealing with people in a sensitive and effective way. There is an innate ability to be diplomatic. Whether coexisting as a team member, a romantic interest, a special companion, a friend, or other relationship, the resonance of coexistence is always present. Imagine being fully conscious of coexisting with others. Compassion and tolerance are very much a part of you, as is idealism. Independence and exploration are also a part of you. You are a teamworker, shouldering your share of the work in addition to occasionally being a consultant for individuals with disagreements. The ability to be diplomatic is innate.